Normal – the vast majority of babies have clear results and the parents should receive a letter confirming this several weeks after the test. Insufficient – sometimes another sample needs to be taken so that the laboratory can perform the tests again – this can be for a number of reasons and there is usually nothing wrong. Abnormal – in very rare cases the tests show abnormal results which indicate the baby may have one of the nine disorders. If this happens, the parents will be contacted by a specialist to arrange for a second test at a regional centre to confirm the result. 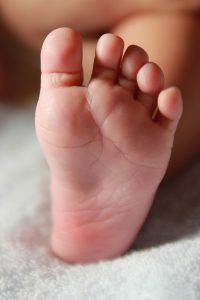 If the second result shows that the baby does have the suspected disorder, advice will be given on the next steps, including treatment and management. Our Newborn Screening app is an interactive resource providing information and advice for new parents following an abnormal result. About 1 in 10,000 babies born in the UK has PKU or MCADD. The other conditions are rarer, occurring in 1 in 83,000 to 100,000 babies. Each year, approximately 176* babies in the UK receive a positive diagnosis via the Newborn Screening Programme. Without treatment, babies with Inherited Metabolic Disorders can become suddenly and seriously ill. Early diagnosis via Newborn Screening enables babies with these conditions to receive treatment or dietary management immediately, improving their health outcomes and preventing severe developmental problems, life-threatening symptoms or even death. If a baby is found to have an Inherited Metabolic Disorder, they will be placed under the care of a Specialist Consultant and supported by at tailored team of Healthcare Professionals at a regional centre in the UK. “Our son had his heel prick test completed by the midwife when he was 6 days old. Three days later we received a phone call from a Specialist Nurse at Sheffield advising that the initial screening had indicated that MCADD was likely and that we would need to take him to see her, the Paediatrician and Dietician at Lincoln Hospital the following day. She also gave us lots of information and advice during that phone call including how to keep our son safe and well until then. She had contacted our Community Midwife and GP too, to advise of the result. I can ecall a Community Midwife ringing us and feeling worried, but well supported. On visiting the Paediatrician, Specialist Nurse and Dietician our son had further tests and we were given more information on feeding and emergency regimes. We were also told about open access to the children’s ward. Why are so few Inherited Metabolic Disorders screened for? Metabolic Support UK sit on the NHS Inherited Metabolic Disorders Screening Advisory Board, and continue to support developments in Newborn Screening and other diagnostic approaches. If your child has been diagnosed with an Inherited Metablic Disorder via Newborn Screening, we can offer emotional support, practical advice and connect you with other families. Please contact us for more information on our services.